SUMMARY: A collection of significant dog-related scientific research articles. AUDIENCE: Makes for a very dry read if you are unused to scientific articles. The contents would only be useful to the layman in summarised and vulgarised form, but are completely inaccessible if you don’t have a bit of a scientific bend. For academic work, it is emminently quotable with some classic review articles, though. REVIEW: The choice of research topics seemed a little random – a common complaint with me ; P – given the title’s broad coverage ambitions it has, and the wealth of research available. This resulted in the book lacking in natural flow, instead giving it a random/chaotic feel. The other side of the coin is that the information in this book was immensely reliable (explanations on experimental design used, clear quotes), which only a few dog books can claim. 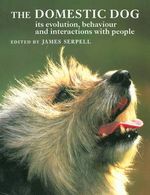 So, for me, the function of this book was to bust popular myths on subjects like feral dog behaviour, separation anxiety, or the origins of breed selection. Browse the Book Review archive. Genre: survey of peer-reviewed literature. Author: Serpell James. Reading Level: Academic. Star: 4. Bookmark the permalink. Post a comment or leave a trackback: Trackback URL.